If your gums are immaculate and not puffy at the end of treatment then we can give the choice of clear retainers or Hawley retainers. 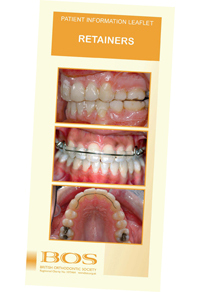 Otherwise we will provide you with a Hawley retainer, which can come in a variety of colour. Hawley Retainers should be worn 24 hours per day, apart from eating, drinking and brushing teeth, for the first 4 months and then for 8 months at night time. Clear retainers should be worn all the time for 2 days, apart from eating, drinking and brushing teeth, then every night. After the first year of retention we advise you continue to wear your retainers every night until you stop growing. For girls this tends to be around 18 years old and for boys around 19 years old. After which it is advisable to wear your retainers 1-2 nights a week for an extended period of time if you wish to prevent any minor changes in final tooth position. Whenever your retainer is out of your mouth, it should be stored safely in a container and not wrapped in a tissue or placed in a pocket where it can easily be lost or broken.